Keeper Of The Old Ways Mage Alguin said that the only way to defeat Mangar would be to confront him with the reliquary containing his bones. Rabbie thinks his friend Fiona the Harper, a historian of songs and legends, might know where the reliquary lies. Song Of The Sentry The Strifespear, the weapon that slew Tarjan, is rumored to be hidden inside the Sentry Tower. No one who has ever entered the Sentry Tower has ever come out alive. Perhaps the lyrics to Across the Seven Realms can help you, if you can find them. You cant enter now Sentry Tower, you shoul return here later. Standing near the stairs, observe what is at the bottom. You will see circling Paladins who may turn out to be too difficult to dig. You can try to sneak past them. You will need Caravan Chest Key to open chest. You can slip between monsters, you will not be able to defeat them now. Use Grappling Hook to visit well. You have to tell him that you are not an adventurer, the you can buy Cabbages. Play Wildland Whistle again return to Stoney in Scara Brae to finish quest. 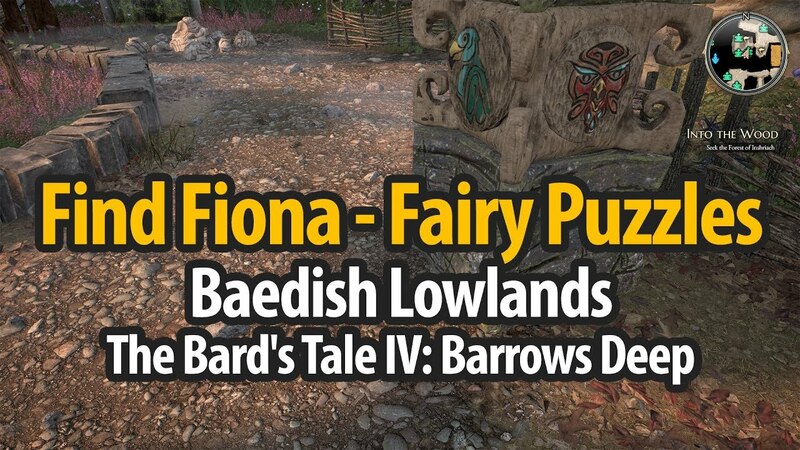 In this part of Baedish Lowlands, to open blocked doors you should solve Fairy Puzzles. See the video below to understand how the puzzles work. Solve (A) and (B) puzzle. After solving (B), teleport will open on the ground, enter it and you will be moved to (12). Fiona the Harper talk to her. Fiona will not trust you, play Wildland Whistle to toal her again. Join Fiona into your party. Fifth Party slot will open here. What the River Takes - Here you learned next Song of Exploration (Ability) What the River Takes, it Summon the spirits of the dead. Use What the River Takes on the skeleton on the ground. It will finish [Keeper Of The Old Ways Quest]. Into The Wood Hearing that Mangar is seeking the portal to the realm of the elves, Fiona is certain he will be heading for the forest of Inshriach, and that he will have hidden his Reliquary in one of the Charn ruins that fester there. After you exit cave, use switch on right side to open closed gate. After joining Fiona to Party. Now you should to move to western part of Baedish Lowlands, avoiding Paladins. 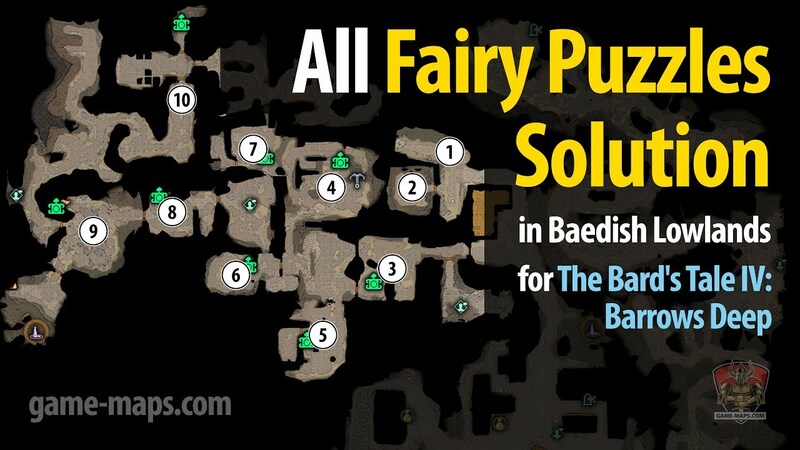 You will have to solve few next Fairy Puzzles. Direct Fairy straight to stones not using Totems. Kill monsters, save and head north. Fairy Puzzle - Birds: Right, Forward, Forward - see video above. Use grappling hook to get chest above. Return to (14) and open doors with Bronze Key. Return to (14) and open doors with Steel Key. Push Fairy to the Totem. And then push Fairy again. Push Fairy to the mushroom, run to the mushroom and activate it. Return to (18) and open doors with Brass Key. 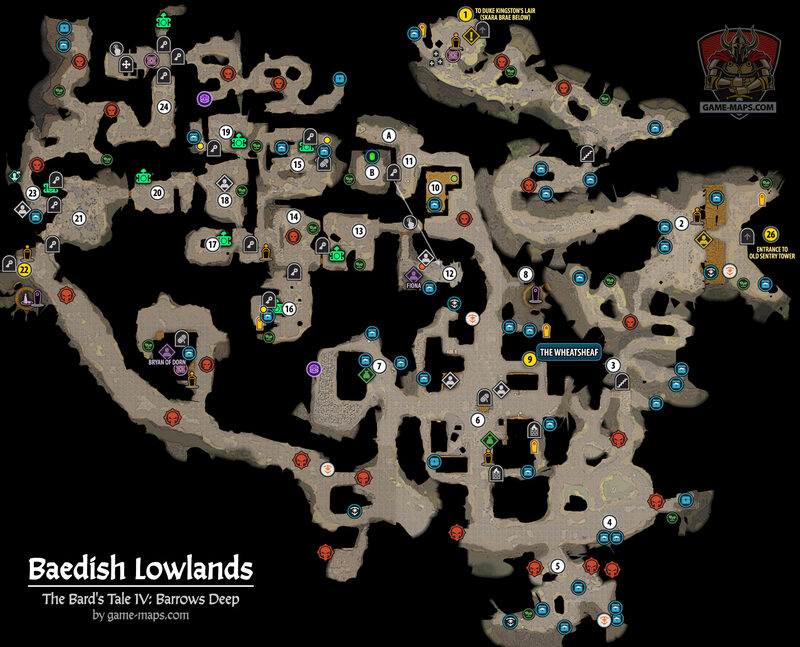 You can continue main quest or you can return to finish Baedish Lowlands. Last Fairy Puzzle - see video above.